More grey today! In these interiors the greyish color on the walls is brightened up by colorful accessories such as the pink vase and chair in the images above and turquoise ceramics in the images below. I will be posting more interiors in black and grey next week so stay tuned! That chandelier is so amazing and beautiful! Lovely pictures! I love the style of these pictures. Wow, wow, wow! I love these. Thank you for finding them! I agree with the comments above. Wow. The living room feel so airy and open even though a darker color has been used. I love it! Do you have any idea where the white and turquoise pottery is from? i really adore these pictures, but most of all the pottery — I’ve been trying to find something with really clean lines but still a sort of traditional shape, and these pieces are just SO pretty! 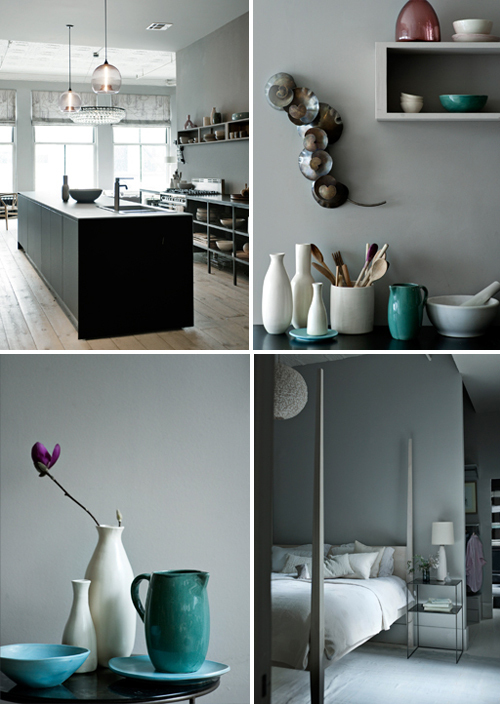 i love grey- these are all completely lovely. Hi Joyce, unfortunately I don’t know where the pottery is from but if I find similar objects I will post about them on the style files. Does anyone know the designer of this chandelier? It is so beautiful and it si perfect for what I’m looking for!!! The beautiful chandelier is from OCHRE in the UK. i have been looking for a good one for ages and have had no luck. that one looks like a dream! any help i would be so thankful for! !